Welcome to the Pretty Pink Posh August Product Release Blog Hop! You should have arrived from amazingly talented Joni Andaya. 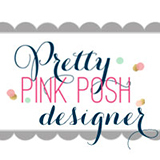 Today I want to share my cards with the adorable new stamp sets along with other new Pretty Pink Posh goodies. PPP sequins always enhance my projects and the August release is no exception!! For my first card, I used the new Camping Friends Stamp Set & Coordinating Dies. For the starry night background, I white heat embossed the moon and tiny stars from the set onto watercolour paper panel, then ink blended on it with Mermaid Lagoon, Faded Jeans, and Seedless Preserves Distress inks using mini ink blending tool. I then added Perfect Pearls Mist and opaque white ink splatters. For the ground, I ink blended with Vintage Photo and Walnut Stain Distress inks. Next, I stamped the images from the set on a separate watercolour paper in VersaFine Onyx Black, watercoloured them with Distress markers, and then die cut them with the coordinating dies. Once the panel was completely dry, I mounted it on an A2 sized white card base using double-sided tape first, and then added all elements as shown to the card front using foam tape. I embellished with a few 3mm PPP clear sequins. Camping under the stars, that’s a very exciting thing to think about!! For my second card, I used the new Blissful Butterflies Stamp Set & Stitched Hexagons Dies. I love to create something beautiful and LOVE butterflies!! First, I randomly stamped the butterflies from the Blissful Butterflies set on watercolour paper panel using VersaMark Embossing ink, heat embossed them in white. I then watercoloured over the heat embossed images with Peerless watercolors and a wet flat brush. I added white ink splatters. Next, I die cut the Stitched Hexagon from heavy white card stock, stamped the sentiment on it in black ink. I stamped the butterflies on a separate white card stock in black, then fussy cut them. Once the watercoloured panel was dry, I mounted it on an A2 sized white card base using double-sided tape first, and then added all elements as shown to the card front using foam tape. I embellished with a few PPP clear sequins. For my last card, I used the new Fox Friends Stamp Set & Coordinating Dies – Those foxes are so darling!! I simply stamped all three foxes from the set on watercolour paper in VersaFine Onyx Black, coloured them with Distress markers, and then die cut them with the coordinating dies. I stacked up foxes (as shown in the picture) using foam tape, and then added black sentiment, I used the Camping Friends stamp set, banner over them. To finish it off, I embellished with a few Pewter Sequins (4mm, 6mm). Your next stop on the hop is super talented Debby Hughes. We hope to inspire you with some beautiful cards as you hop along to each of the designer’s blogs! Thank you so much for stopping by. Have a lovely day!! This entry was posted in Pretty Pink Posh, Watercolor cards and tagged Blog hop, Butterfly, Pretty Pink Posh, Summer, Watercolor. Bookmark the permalink. What great cards! I absolutely love the starry sky you created – it reminds me of the Milky Way!